My daughter Lily generally takes her lunch to school. She prefers milk over a juice box. Since the milk would be warm by the time she would drink it, she buys the milk. The school has a food account and Lily has plenty of money in it to buy whatever she wants. Lately when Lily gets home from school my wife and I noticed she was guzzling something to drink. My wife and I interrogated her but were unable to extract why she was suddenly dehydrating herself. It was obvious Lily was withholding some information. My wife checked her food account and confirmed she was not spending anything. We asked Lily again and she admitted to not buying milk but gave no explanation. We volunteered to add a juice box to her lunch but she refused. 1. 5th graders arrive first, followed by the 4th graders, followed by the 3rd graders. 2. Lily is in 3rd grade. There are three 3rd grade classes consisting of 20 to 30 students. Lily’s class is the last class to enter. 3. Holding seats for friends is not allowed. 4. Peanut-free food eaters are required to sit at the grade specific “peanut table”. I had an idea. Let’s see what would happen if Lily bought her milk. I made an assumption it takes about 15 minutes to eat. Buying milk is time consuming and sometimes does not give you much time to eat. Maybe Lily is going without a drink so she can finish her food? The other observation is buying a milk results in Lily sitting in a drastically different lunch seat and table. I wondered if this had something to do with Lily’s behavior. I asked Lily and my hunch was correct. Lunch seats are first come first serve. You are not allowed to hold someone’s seat. Lily would take her seat and go without a drink to eat with her friends. Not a great reason but, if I am being honest with myself, probably would have thought the same thing at 9 years old. Mystery solved but I could not help exploring how to fix the bigger issue of limited time to eat. I turned back to my model. The current process has milk buyers standing in the same line as food buyers. I decided to explore what would happen if one of the volunteer parents walked around and allowed students to purchase milk from their seat. Below is a comparison chart. 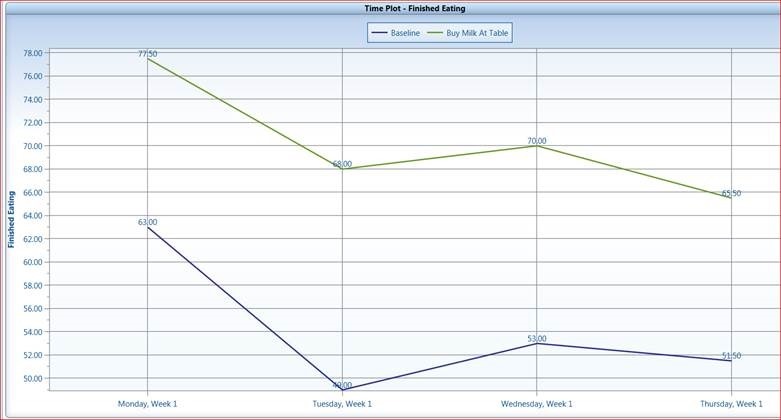 Notice the “Buy Milk at Table” scenario (green line) has a greater quantity of students finishing their lunch in time. In addition, my daughter can now drink milk with her meal with her friends. This entry was posted in General Simulation and tagged juice box. Bookmark the permalink.